Spotify CEO Daniel Ek has written a blog post defending how much money the streaming service pays artists, saying Spotify has paid more than $US2 billion to labels and other entities that then distribute a cut to the artists themselves. This issue of Spotify underpaying artists resurfaced last week when Taylor Swift pulled her entire catalogue of music from Spotify after refusing to put her new hit album “1989” on the service. Swift has previously said that artists need to protect their work and value it appropriately, and Spotify has previously been criticised for not paying artists enough. “Taylor Swift is absolutely right: music is art, art has real value, and artists deserve to be paid for it,” Ek wrote. Part of the problem is that the amount of money Spotify pays labels does not equal the amount of money artists see from allowing their music to be streamed. Last month, Jimmy Buffett complained that artists who stream their music on Spotify are “at the end of the pipeline” when it comes to the money Spotify pays labels for permission to stream albums. And the money Spotify pays labels, while it amounts to a reported 70% of the company’s revenue, averages less than a penny per play. That sounds like a big number, but keep in mind that one week of album sales for Swift’s new record 1989 would do ~$US12 million in gross sales. Ek also seemed to shift blame to the record labels for not paying artists a big enough cut of the money the labels receieve from Spotify. 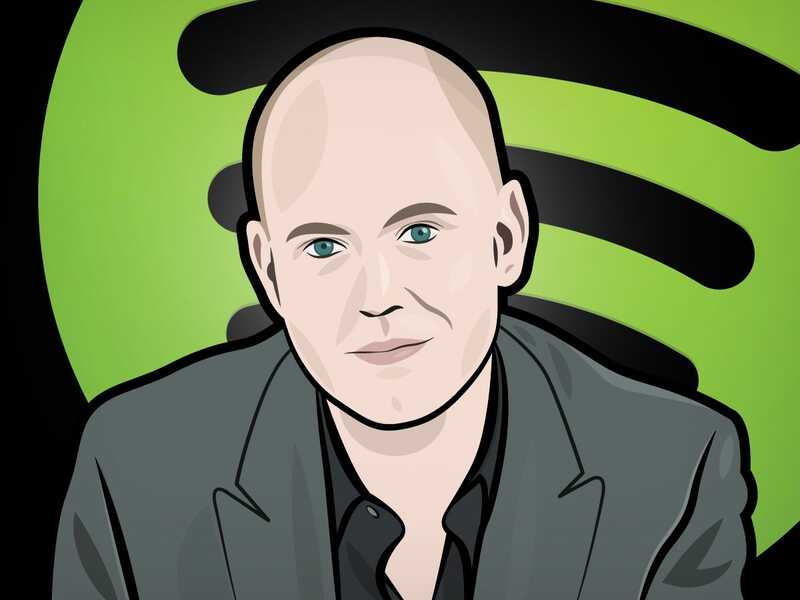 About 25% of Spotify’s 50 million active users pay for the service, according to Ek. The users who stream music for free have to listen to ads, which provide another stream of revenue for Spotify. Spotify premium subscribers pay about $US120 per year for the service. Taylor Swift is absolutely right: music is art, art has real value, and artists deserve to be paid for it. We started Spotify because we love music and piracy was killing it. So all the talk swirling around lately about how Spotify is making money on the backs of artists upsets me big time. Our whole reason for existence is to help fans find music and help artists connect with fans through a platform that protects them from piracy and pays them for their amazing work. Quincy Jones posted on Facebook that “Spotify is not the enemy; piracy is the enemy”. You know why? Two numbers: Zero and Two Billion. Piracy doesn’t pay artists a penny — nothing, zilch, zero. Spotify has paid more than two billion dollars to labels, publishers and collecting societies for distribution to songwriters and recording artists. A billion dollars from the time we started Spotify in 2008 to last year and another billion dollars since then. And that’s two billion dollars’ worth of listening that would have happened with zero or little compensation to artists and songwriters through piracy or practically equivalent services if there was no Spotify — we’re working day and night to recover money for artists and the music business that piracy was stealing away. When I hear stories about artists and songwriters who say they have seen little or no money from streaming and are naturally angry and frustrated, I’m really frustrated too. The music industry is changing — and we’re proud of our part in that change — but lots of problems that have plagued the industry since its inception continue to exist. As I said, we’ve already paid more than $US2 billion in royalties to the music industry and if that money is not flowing to the creative community in a timely and transparent way, that’s a big problem. We will do anything we can to work with the industry to increase transparency, improve speed of payments, and give artists the opportunity to promote themselves and connect with fans — that’s our responsibility as a leader in this industry; and it’s the right thing to do. We’re trying to build a new music economy that works for artists in a way the music industry never has before. And it isworking — Spotify is the single biggest driver of growth in the music industry, the number one source of increasing revenue, and the first or second biggest source of overall music revenue in many places. Those are facts. But there are at least three big misconceptions out there about how we work, how much we pay, and what we mean for the future of music and the artists who create it. Let’s take a look at them. Myth number one: free music for fans means artists don’t get paid. On Spotify, nothing could be further from the truth. Not all free music is created equal — on Spotify, free music is supported by ads, and we pay for every play. Until we launched Spotify, there were two economic models for streaming services: all free or all paid, never together, and both models had a fatal flaw. The paid-only services never took off (despite spending hundreds of millions of dollars on marketing), because users were being asked to pay for something that they were already getting for free on piracy sites. The free services, which scaled massively, paid next to nothing back to artists and labels, and were often just a step away from piracy, implemented without regard to licensing, and they offered no path to convert all their free users into paying customers. Paid provided monetization without scale, free reached scale without monetization, and neither produced anywhere near enough money to replace the ongoing decline in music industry revenue. We had a different idea. We believed that a blended option — or ‘freemium’ model — would build scale and monetization together, ultimately creating a new music economy that gives fans access to the music they love and pays artists fairly for their amazing work. Why link free and paid? Because the hardest thing about selling a music subscription is that most of our competition comes from the tons of free music available just about everywhere. Today, people listen to music in a wide variety of ways, but by far the three most popular ways are radio, YouTube, and piracy — all free. Here’s the overwhelming, undeniable, inescapable bottom line: the vast majority of music listening is unpaid. If we want to drive people to pay for music, we have to compete with free to get their attention in the first place. So our theory was simple — offer a terrific free tier, supported by advertising, as a starting point to attract fans and get them in the door. And unlike other free music options — from piracy to YouTube to SoundCloud — we pay artists and rights holders every time a song is played on our free service. But it’s not as flexible or uninterrupted as Premium. If you’ve ever used Spotify’s free service on mobile, you know what I mean — just like radio, you can pick the kind of music you want to hear but can’t control the specific song that’s being played, or what gets played next, and you have to listen to ads. We believed that as fans invested in Spotify with time, listening to their favourite music, discovering new music and sharing it with their friends, they would eventually want the full freedom offered by our premium tier, and they’d be willing to pay for it. We were right. Our free service drives our paid service. Today we have more than 50 million active users of whom 12.5 million are subscribers each paying $US120 per year. That’s three times more than the average paying music consumer spent in the past. What’s more, the majority of these paying users are under the age of 27, fans who grew up with piracy and never expected to pay for music. But here’s the key fact: more than 80% of our subscribers started as free users. If you take away only one thing, it should be this: No free, no paid, no two billion dollars. Myth number two: Spotify pays, but it pays so little per play nobody could ever earn a living from it. First of all, let’s be clear about what a single stream — or listen — is: it’s one person playing one song one time. So people throw around a lot of stream counts that seem big and then tell you they’re associated with payouts that sound small. But let’s look at what those counts really represent. If a song has been listened to 500 thousand times on Spotify, that’s the same as it having been played one time on a U.S. radio station with a moderate sized audience of 500 thousand people. Which would pay the recording artist precisely … nothing at all. But the equivalent of that one play and it’s 500 thousand listens on Spotify would pay out between three and four thousand dollars. The Spotify equivalent of ten plays on that radio station — once a day for a week and a half — would be worth thirty to forty thousand dollars. Now, let’s look at a hit single, say Hozier’s ‘Take Me To Church’. In the months since that song was released, it’s been listened to enough times to generate hundreds of thousands of dollars for his label and publisher. At our current size, payouts for a top artist like Taylor Swift (before she pulled her catalogue) are on track to exceed $US6 million a year, and that’s only growing — we expect that number to double again in a year. Any way you cut it, one thing is clear — we’re paying an enormous amount of money to labels and publishers for distribution to artists and songwriters, and significantly more than any other streaming service. Myth number three: Spotify hurts sales, both download and physical. This is classic correlation without causation — people see that downloads are down and streaming is up, so they assume the latter is causing the former. Except the whole correlation falls apart when you realise a simple fact: downloads are dropping just as quickly in markets where Spotify doesn’t exist. Canada is a great example, because it has a mature music market very similar to the US. Spotify launched in Canada a few weeks ago. In the first half of 2014, downloads declined just as dramatically in Canada — without Spotify — as they did everywhere else. If Spotify is cannibalising downloads, who’s cannibalising Canada? Calvin Harris to Eminem had number ones and were on Spotify at the same time too. Here’s the thing I really want artists to understand: Our interests are totally aligned with yours. Even if you don’t believe that’s our goal, look at our business. Our whole business is to maximise the value of your music. We don’t use music to drive sales of hardware or software. We use music to get people to pay for music. The more we grow, the more we’ll pay you. We’re going to be transparent about it all the way through. And we have a big team of your fellow artists here because if you think we haven’t done well enough, we want to know, and we want to do better. None of that is ever going to change. We’re getting fans to pay for music again. We’re connecting artists to fans they would never have otherwise found, and we’re paying them for every single listen. We’re not just streaming, we’re mainstreaming now, and that’s good for music makers and music lovers around the world.